The Humanitarian Country Team (HCT) is a forum of humanitarian organizations operating in the occupied Palestinian territory (oPt). It includes national and international actors involved at the country level in the provision of humanitarian assistance and protection, and was established in the oPt in 2008. The HCT is also the policy-making forum on issues related to humanitarian access in the oPt. It comprises representatives of UN agencies undertaking humanitarian activities in the oPt, representatives from the international NGO consortia Association of International Development Agencies (AIDA) and of national NGO networks. The Humanitarian Coordinator chairs the monthly HCT meeting while OCHA provides the necessary secretariat support. The International Committee of the Red Cross, the International Federation of Red Cross and Red Crescent Societies, and Médecins Sans Frontières have a status of “active” observer. The HCT Advocacy Working Group (AWG) was established with the purpose of coordinating advocacy efforts amongst HCT members. OCHA chairs this group and the members are representatives of the different clusters and sectors. The AWG facilitates both coordinated advocacy and undertakes joint initiatives and events. Activities include public information and quiet diplomacy and are targeted at varied audiences, including government authorities, civil society and media. The group is guided by the HCT Advocacy Strategy and Action Plan which in turn supports the implementation of the Humanitarian Programme Cycle and its strategy. The AWG also develops common messaging on humanitarian concerns, focused on increasing respect for international humanitarian law and international human rights law, and improving the protection of civilians. HCT advocacy focuses on altering the policies and practices creating humanitarian needs in the oPt. Key areas include preventing forced displacement and forcible transfer and ensuring freedom of movement and humanitarian access. AIDA is a membership body and coordination forum of international non-governmental and non-profit organizations (INGOs) that works to promote appropriate development and humanitarian programs in the oPt. Its core functions are networking the relief and development assistance community, facilitating information-sharing and promoting advocacy, security, and training. AIDA provides forums for regular discussion on operational issues, coordinates joint actions, advocates on issues as agreed by members and organizes joint advocacy activities, provides a bridge between the INGO community and Palestinian civil society and NGOs, facilitates cooperation and coordination with the broader donor community and serves as a contact for external bodies requiring information about INGO activities in the oPt. AIDA has about eighty members and is additionally a member of the Humanitarian Country Team. Palestinian NGOs are represented by several umbrella bodies, one of which is PNGO which is part of the HCT. The Palestinian NGO Network (PNGO) seeks to support, consolidate and strengthen Palestinian civil society on the basis of the principles of democracy, social justice and sustainable development. PNGO comprises about seventy member organizations. At the field level, the Resident/Humanitarian Coordinator (RC/HC) is responsible for designating Cluster Lead Agencies for all key humanitarian response sectors, in consultation with the HCT and the Emergency Relief Coordinator. The Inter-Cluster Coordination Group, composed of cluster and sector leads in the oPt, meets monthly in a meeting chaired by OCHA. In Gaza the Inter-cluster group also meets on a monthly basis to discuss humanitarian coordination, and operational issues. Dates of the Inter-Cluster meetings can be viewed here. For Cluster Coordinators’ contact information, please click here. 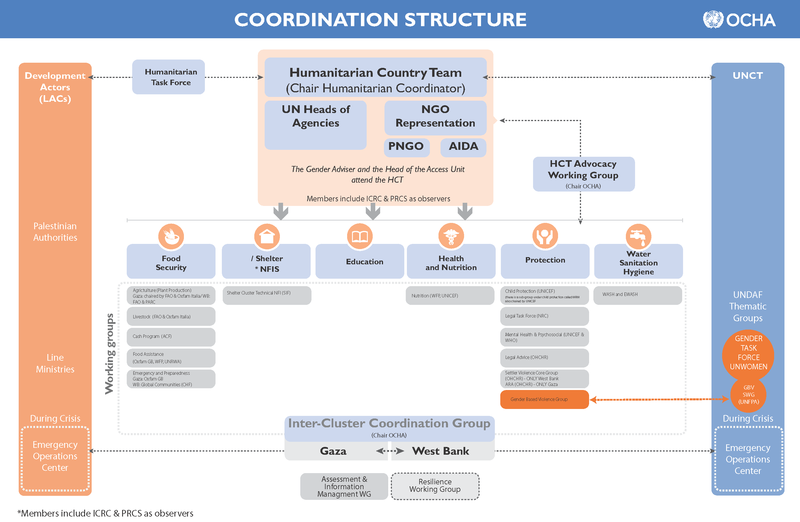 Thematic coordination groups are a key instrument of humanitarian response. They contribute to the HCT analysis by providing essential information from needs assessments and monitoring to support the HCTs development of Strategic Objectives and other policy guidance. Thematic groups bring together all stakeholders working within a defined area of expertise, including local authorities, non-governmental organizations and UN agencies, and are the forum for coordination of every aspect of response formulation, including assessments, data management, strategic planning, setting technical standards, monitoring and reporting on the effectiveness of the response and contingency planning. They are also actively engaged in humanitarian advocacy.